Gourmet Marshmallows ~ A Winter Treat! Our friend Tina from The Pink Spatula recently donated her gourmet marshmallows for our gift bags for our Shoppers Drug Mart Event with Stila Cosmetics. 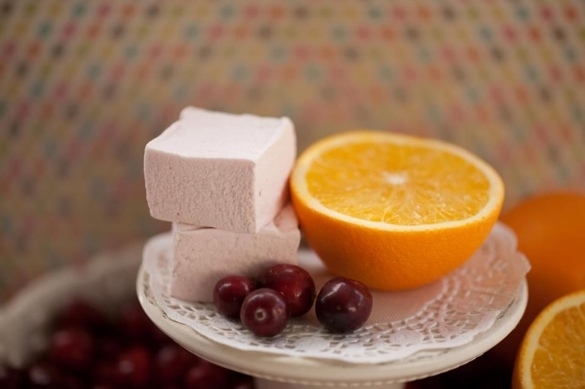 She graciously included her cranberry orange marshmallows…beautiful, soft, pink confections that perfectly matched the colors of the Look Good Feel Better cancer charity we were supporting that night!!! The Pink Spatula’s fall and winter collection is now available. We love that Tina comes up with new flavors each season, using the finest real ingredients. Her marshmallows are made with care in small batches. Here are the fall and winter flavors…. cranberry orange – use these to top a cup of fruit based or rooibos tea, in fruit salads and on fruit skewers. toasted coconut – these are some of my favorite toasted for s’mores. Watch the coconut that it doesn’t burn too much, but it gets nice and crispy when roasted! cafe au lait – my girls LOVE these on top of hot chocolate to give it that hint of coffee flavor. 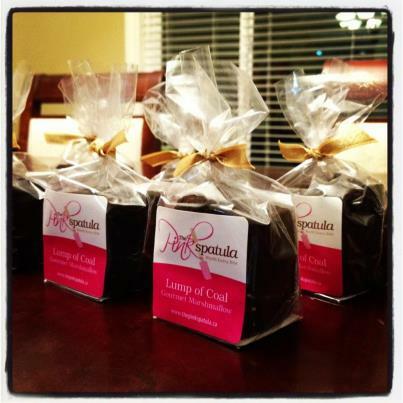 And available this week…….Lump of Coal marshmallows….vanilla marshmallows with rippled dark chocolate dusted with black cocoa!!! Ok, could there be a more perfect stocking stuffer!?! They are available this week at Lepp Farm Market and December 1 at Well Seasoned. You can also buy The Pink Spatula’s marshmallows online at FoodiePages (click here). We LOVE using Tina’s marshmallows for s’mores. They seriously take a childhood fave to a totally new level! We’ve featured gourmet s’mores using her marshmallows. S’mores are a fantastic winter treat when you use an indoor fire bowl (click here to find out how!). This would be the perfect dessert for a New Year’s Eve party…fun and interactive! The Pink Spatula’s marshmallows make the most perfect winter hostess gift when paired with a high quality hot chocolate mix (there are lots of cute tins at HomeSense right now!). Tie both together with a festive ribbon and you’re good to go to your next party or get together. Another super cute and yummy idea is to make cocoa cubes. Here’s Tina’s recipe! Line an 8 x 8” cake pan with parchment or foil. Measure sweetened condensed milk and cream into a large pot. Heat over low heat until steaming. While it’s heating melt butter and sift in cocoa powder. Stir to combine into a paste. Set aside. Once cream has heated whisk in cocoa mixture. Next, add chopped chocolate and whisk until smooth and shiny. Pour into prepared pan and jiggle pan to level mixture. You may dust with cocoa powder if desired. 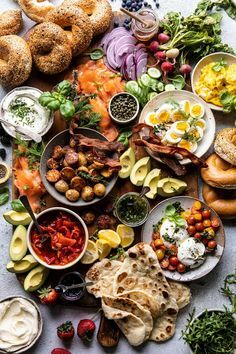 Leave overnight to set at room temperature. Cut into 1 ¼” squares. Leave as is or roll in more cocoa or crushed candy canes. Stick a wooden skewer in the center of each. Store airtight for 2 weeks at room temperature or freeze for longer storage. Use 6 oz (¾ cup) hot milk for each cube. 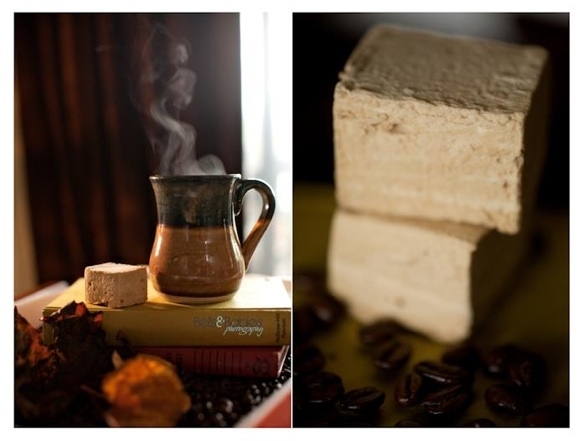 A cafe au lait marshmallow in hot chocolate…a mocha in reverse! To amp this up a notch, add one of The Pink’s Spatula’s cafe au lait marshmallows onto the skewer, individually wrap it and add a ribbon. It’s the perfect giveaway for your Christmas party or put a few into a pretty mug for a hostess gift. A huge congrats to The Pink Spatula for being honored with the Mission Chamber of Commerce Best Home Based Business award!!! We agree and you totally deserve it! Keep the great collections of marshmallows coming!